Car Wraps is a great opportunity to build your Brand on a daily basis by wrapping your vehicle and delivery/service vehicles in your fleet or any staff members vehicles. Wrapping your company vehicles can help support your other marketing activities in an efficient way. Take a look at the various wrap examples and give us a call to discuss your car wrap needs as part of your Marketing plan for your business. Contact Paul Cookson at 416.286.286.2860 or by e-mail at paul@adarmygroup.com for details. Car wrapping is a marketing tool that uses vehicles as moving advertisements. The practice consists of partially or completely wrapping a car in an advertisement. The finished product is basically a moving billboard. This form of advertising can be accomplished by painting the vehicle; however, a better method incorporates large vinyl sheets referred to as "decals." These large vinyl sheets are easier to remove and they help reduce the costs associated with applying new advertisements. It is important to add that a decal is less-permanent than paint. For that reason, decals are considered a more efficient method of car wrapping. Decals are ideal for vehicle customization and mobile advertisements. In some instances, race cars prefer decal car wraps because they are lighter than paint. For many, a car wrap is an ideal way to add character to a vehicle or even earn extra money. If interested in a car wrap, call Ad Army Group for a consultation with marketing expert Paul Cookson today. A marketing expert is the perfect choice when planning a strategy for wrapping a vehicle. This marketing expert believes a car wrap is a good way to earn extra exposure for any business. Marketing expert and industry analysts believe car wrapping is an effective method of advertising. When the marketing expert for 3M conducted research; it suggested that 99% of their survey respondents believe mobile advertising is more effective than other forms of advertising. The marketing expert for the American Trucking Association stated that 91% of their targeted drivers noticed text and graphics on truck advertisements. 3M states that 94% of survey respondents remembered seeing the mobile advertisement and 80% successfully recalled the specific advertisement. Marketing expert believe mobile advertisements can lead to a sales increase of up-to 107%. These numbers are extremely impressive and prove that car wrapping is a smart choice for earning extra attention for a business or fleet. Car warps can be profitable, stylish, and visually appealing. Over the past decade, there have been several advancements in car wraps and mobile advertisement technology. These advancements have led to new types of vinyl that are designed specifically for car wrap advertisements. One of these innovative developments is a vinyl that uses microscopic glass beads and bubble-preventing air channels. This advancement prevents the adhesive from sticking to the surface until the user is completely ready to apply it. The glass beads allow the vinyl to be constantly removed and reapplied, throughout the wrapping process, for a smooth, bubble-free application. When the car wrap is fully applied, the vinyl is heated using a torch or heating gun to mold the decal around the vehicle. This innovation provides a car wrap that is evenly layered and eye-catching. In order to plan the perfect strategy for a car wrap, consult with a marketing expert. Ad Army Group has a marketing expert that can offer information and same day price quote for any vehicle. Marketing expert Paul Cookson can answer all questions pertaining to car wraps. AdArmyGroup.com completes custom promotional car wraps that are extraordinary. The company customizes vehicles that resemble foods such as hot dogs or sandwiches. They even customize vehicles using fur to resemble animals. Paul Cookson and his team at Ad Army Group does a great job of designing and customizing a car wrap to incorporate interactive and 3D elements. This company uses an in-house graphic design team that completes the wraps using the latest software. The software is a great tool used to ease clients through each part of the design process. Ad Armygry Group prides itself on completely satisfying the client with a dynamic and professional image. The graphic design team is friendly and readily available to provide detailed suggestions. They are really good in materializing the client’s vision through text, color, and logo combinations. This company understands that customer consultation is vital to the design process. Ad Army Group does a great job designing and implementing car wraps, which makes it one of the best in the industry. We do the printing, designing, installing, and removal of all car wraps. On most vehicles, the car wrap covers the entire body of the vehicle. The windows are covered using a unique material that is perforated so the driver can see out. In most cases, decals are designed to cover the rear and side windows on a vehicle. When applying car wraps, the advertisement is typically divided into a several smaller pieces. This method is used to properly cover all movable parts on the vehicle. For example, moveable parts such as the doors, the fuel tank cover, and the trunk may require smaller pieces of the advertisement. AdArmyGroup laminates all wraps in order to protect the material from severe weather conditions as well as wear and tear. The company uses 3M or Avery brand materials for all car wraps. Generally, the car wrap is completed and ready to pick-up in less than 2 weeks. The printing process takes 14 days from the approval of the final art work. The installation process is between 1-2 days. The costs can fluctuate depending on the size of vehicle and if a full or partial wrap is required. In most cases, wrapping the roof and other parts are an additional fee. AdArmyGroup offers both a Fleet Change Program and a Truck Banner System. The Fleet Change Program offers a service that allows a truck to use the back door to display updated graphics. This is a monthly graphic change program that applies the most current advertisement on the back door of the truck fleet. This is ideal for any fleet because it keeps the advertisement current, while only changing a small area of graphics. The Truck Banner System is used to avoid the need to regularly change the message of the fleet. The Truck Banner System lets the fleet reuse the vinyl graphics. This also minimizes installation times. This program allows the fleet to change the message on a monthly or seasonal basis. Currently, CarWraps is the bus wrap specialist across the nation. The design and styles of the wraps vary, however; the design team creates wraps that have the greatest visual impact. CarWraps has more than enough templates for over 1,000 vehicles. AdArmyGroup.com provides a variety of products and services to meet the car wrap needs of its clients. Services include fleet graphics, full wrap graphic package, digital imaging/printing, licensed graphic removers, car wraps, full vehicle wraps, trailer graphic installations, vinyl lettering, full color graphics, car advertisements, full vehicle images, business logos placed on vehicles, car images, vinyl graphics, vehicle decals, and more. We offers cost efficient graphics solution for all client needs. AdArmyGroup.com also provides a variety of products to satisfy the signage needs of their clients. Products include custom lit sign boxes, signs, banners, safety signs, channel lettering, static cling posters, floor graphics, and car signs. The installation process is fast and reliable because of the installation team that is comprised of in-house veteran installers. These installers have acquired more than 25 years of graphic art experience. The installation team prides itself on the ability to provide courteous and professional service. This team sets a high standard for both quality and consistency. The team is determined to offer premium work using attention to detail and solid work ethic. Overall, car wraps are a great advertising tool. Car wraps are used to add character to a vehicle, to earn extra money, or even gain a company extra exposure. There are not many drawbacks to using this promotional tool. One of the major issues connected to wrap advertising was the reduction of visibility of the advertisement. However, this concern was resolved by the altering the perforation size used on the vinyl. Manufactures realize that smaller perforation sizes can increase the advertisements visibility. By using a 70/30 pattern, manufactures allow twenty percent more of the picture to be displayed. Driver visibility was also an issue for car wraps. State and county regulations vary, however; side windows and vehicle windshields should not be covered. Currently, state and county authorities have created specific regulations in order to tackle safety concerns associated with car wrap advertising. 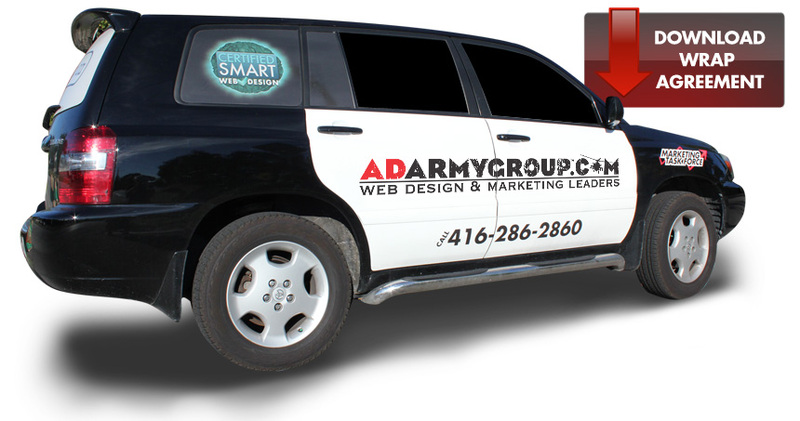 If interested in a car wrap, contact or call Ad Army Group at 416-286-2860 for a consultation with marketing expert Paul Cookson today. A marketing expert can help plan a strategy for wrapping a vehicle. This marketing expert believes a car wrap is great way to gain extra exposure for a business or fleet.